shmups.system11.org • View topic - Shoot the Core-cast Podcast - Episode 10 Now Online! Shoot the Core-cast Podcast - Episode 10 Now Online! Post subject: Shoot the Core-cast Podcast - Episode 10 Now Online! Announcing Shoot the Core-cast, a shmup-themed podcast to accompany the RF Generation Shmup Club! Each month, we play a different shooter, and in the podcast, we discuss each game at length, talking about the game's design, discuss strategy, share high scores, and just have fun! In Episode 01, we look at the original R-Type, an innovative title from developer Irem, and in Episode 02, we discuss Konami's Gradius, the game that set the standard for what horizontal shooters would be for the next 2 decades, and brought many innovations to the genre. Episode 06 is now online, all about Steel Empire, from HOT-B. We have t-shirts now, also! Last edited by FRO on Wed Apr 17, 2019 4:38 pm, edited 10 times in total. Post subject: Re: Shoot the Core-cast Podcast Now Online! I'm loving this new influx of shmup podcasts. Subscribed! Awesome stuff man! I'll definitely be tuning in. Post subject: Re: Shoot the Core-cast Podcast - Episode 04 Now Online! Bump for the announcement of Episode 04, about Warning Forever! Post subject: Re: Shoot the Core-cast Podcast - Episode 05 Now Online! Bump for the announcement of Episode 05, discussing Capcom's classic 1942! Are the older Episodes available to listen to? I really enjoyed 5. Post subject: Re: Shoot the Core-cast Podcast - Episode 06 Now Online! Bump to announce Episode 06, discussing Steel Empire! Totally forgot to announce Episode 07, our Atari 2600 Showdown! We took on 2 2600 proto-shmups in December, Imagic's Demon Attack, and Activision's Spider Fighter, to see which was the better representation of the genre, taking the lead from previous single-screen shooting games like Space Invaders, Galaxian, Phoenix, and Gorf. Which game holds up better, and held our attention more? Have a listen, and then let us know what you think! Post subject: Re: Shoot the Core-cast Podcast - Episode 07 Now Online! Post subject: Re: Shoot the Core-cast Podcast - Episode 08 Now Online! 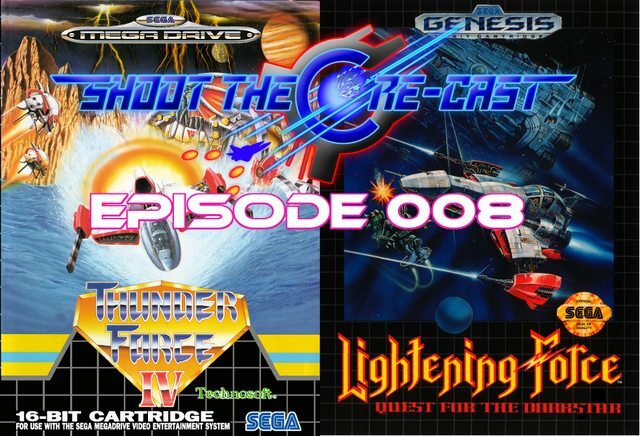 Episode 008 is online now, covering Thunder Force IV and Lightening Force! Check us out and subscribe (and rate!) on Apple Podcasts! We're listed on Google Play - subscribe and review the podcast over there! We're on Stitcher Podcasts now, as well, so if you use that service, have a listen to the show from there! We have t-shirts! Help support the podcast, and rep the shmup community by buying a Shoot the Core-cast tee! Thanks for listening, and any feedback would be greatly appreciated! Post subject: Re: Shoot the Core-cast Podcast - Episode 09 Now Online! Episode 009 is up now, all about Zanac, and some discussion of Zanac NEO! 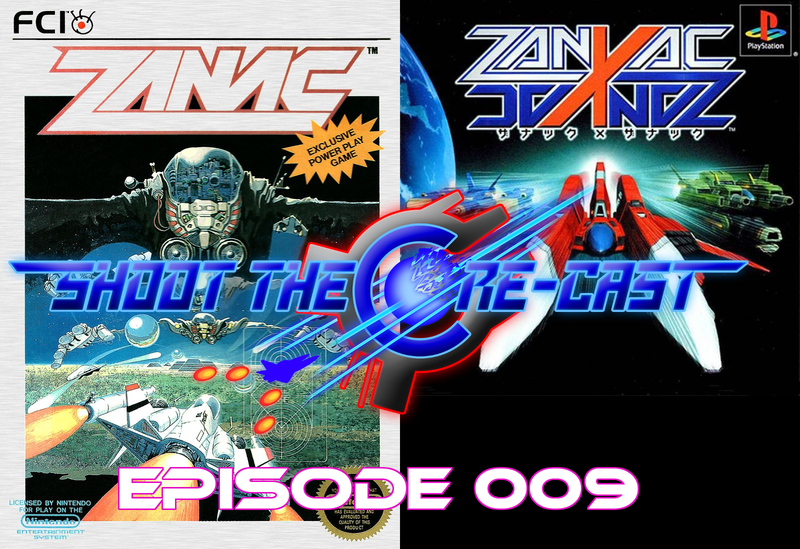 This is Episode 009 of Shoot the Core-cast! In this edition, MetalFRO and Addicted look at Zanac, the classic NES shooter that most of us played as kids. Does it hold up? What's good about it? Why is it so well loved? To help us answer these questions, we called upon Collectorcast members Duke.Togo and Crabmaster2000, to weigh in on the game. We hope you enjoy it! The episode art looks really cool! I'm giving the episode a listen today I'm actually not super familiar with this game, though I have heard of it. Looking forward to learning more. Welcome to Episode 010 of Shoot the Core-cast! 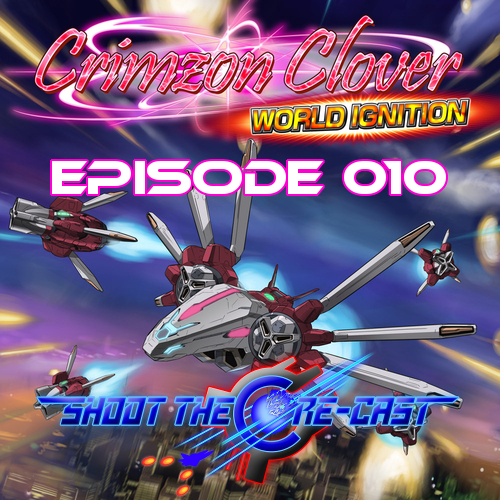 This time around, MetalFRO and Addicted cover Crimzon Clover: World Ignition, the the hit PC shooter from Japanese doujin developer, Yotsubane! This danmaku game is quite special, and has been well received in the shooting game community. Here to help us discuss this game is Mark_MSX, from The Electric Underground Podcast! We cover the game's mechanics, try to "break" down the scoring, and look at its impact on the shmup scene over the last few years. Thanks for listening! Post subject: Re: Shoot the Core-cast Podcast - Episode 10 Now Online! It was really fun being on the show!